You’ve probably seen Ferrofluid before: it’s a black goo that contains iron particles and reacts to magnets in a fascinating way. 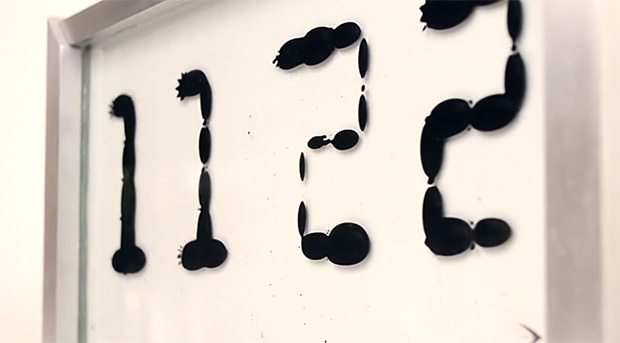 Zelf Koelman became so enamoured with the little blobs that he and his team spend “a few thousand hours” developing Ferrolic, a special display piece that uses Ferrofluid in creative and mesmerizing ways. In the front, the display has a basin comparable to an aquarium in which Ferro Fluid can move freely. Behind the scenes powerful electromagnets enable Ferollic to influence the fluid’s shape, to pick it up and move it around. Both modules, the basin and the electronics, sit secure in an aluminium frame. The software behind these electromagnets, and thus the shapes and information displayed, can be edited. Ferrolic is controlled by an intelligent internal system that is accessible trough a web-browser. In this way users can assign “the creatures” to display time, text, shapes and transitions. Experienced users can create animations from their own custom shapes. In the display above, Ferrolic is being used as a clock, but that’s just one of the many thousands of things it can display. It’s a work in progress, and a Kickstarter is planned for some time in the future. But for now there are 24 early production models available for anyone who’d like to develop for Ferrolic… at the princely sum of €7,500 or about $8,500USD.